This is the main portal. There were originally three others related to the Emma Group. Depth: Main tunnel approx. 312 feet, Annex tunnel approx. 278 feet, Related shaft approx. 25 feet deep, At one time there was a fourth tunnel that was approx. 500 feet deep on the lower slopes of Parker Mountain. Distance shot of the main Emma portal on an old wagon road. Above the wood debris is an annex tunnel. The Emma Mine is located deep in the dry and windswept reaches of Soledad Canyon. Soledad, which literally means "loneliness", was once roamed by bandits and grizzly bears (you heard that right, grizzlies). It's hard to imagine what these massive beasts ate in such an arid and desolate place, but I'm sure that cattle were on their menu. Less than 75 years after the discovery of gold in at Sutter's Mill in 1848, almost every grizzly bear in California had been tracked down and killed. 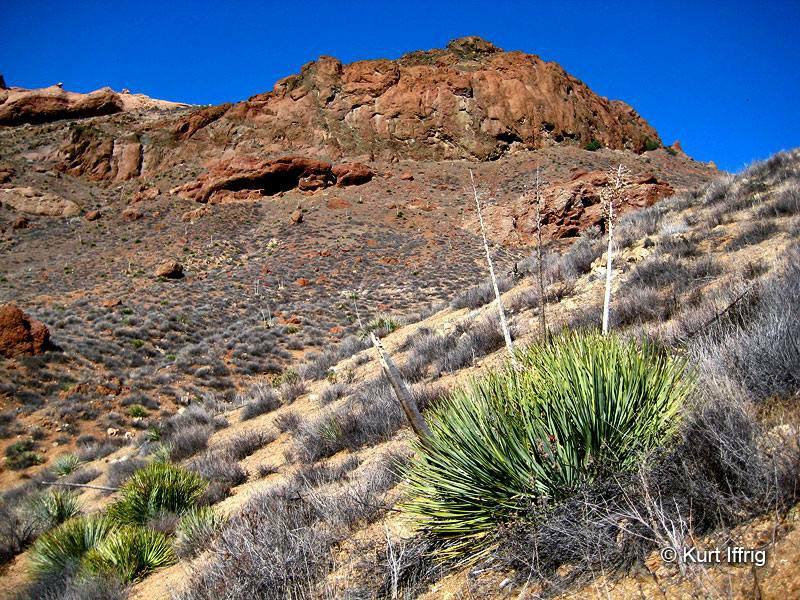 It is estimated that 10,000 once roamed the Golden State. The last known grizzly in California was killed in 1924. Today the likeness of a grizzly named Monarch adorns the California state flag. 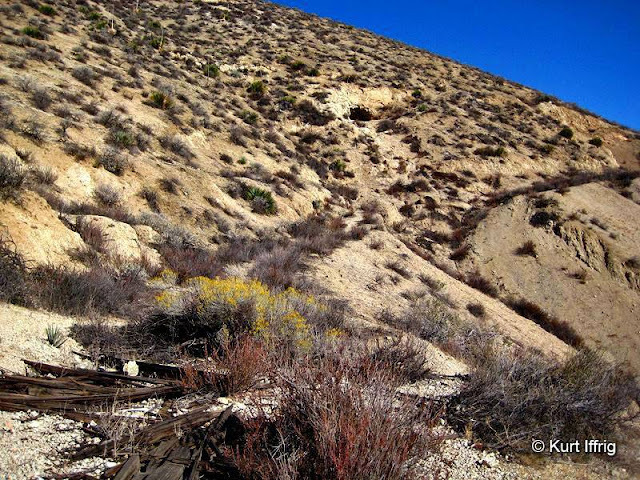 Soledad Canyon was once the central corridor for ore transportation to Los Angeles from mines as far away as Cerro Gordo. Inside the main Emma adit. This mine has several moderate cave-ins with a roughly five foot ceiling. Originally there were four tunnels associated with the Emma family of mines, the Emma, the Bullion, the Pacific and the London. The deepest tunnel, which measured 500 feet is long gone, but three still remain. 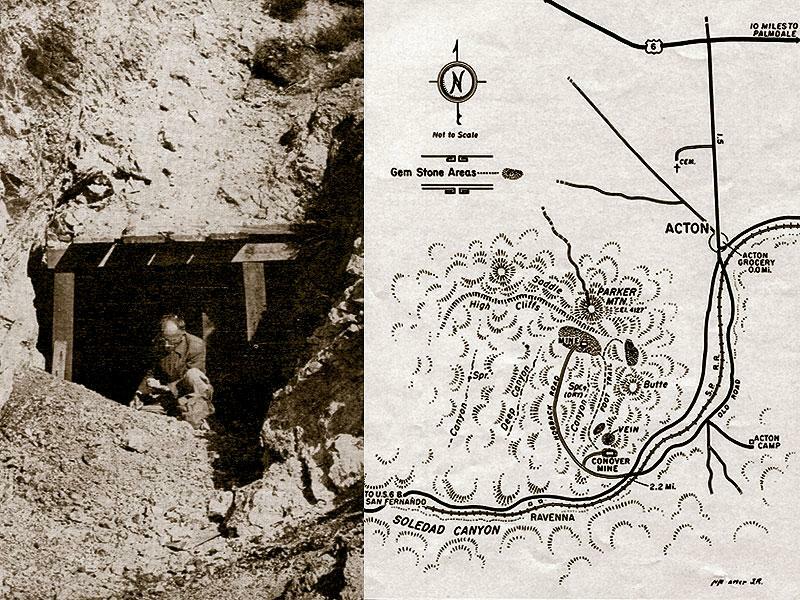 The main adit, located on a hillside above Soledad Canyon Rd. is about 312 feet deep. It's roughly five feet tall on the inside with several moderate cave-ins. 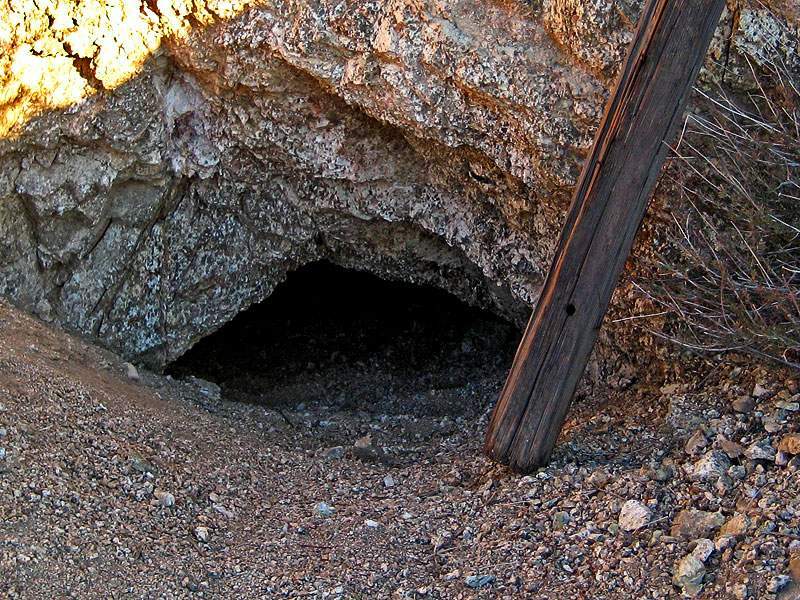 Nearby there is an annex mine that is reportedly 278 feet deep, however at the time I visited the entrance had narrowed and was too small to enter. This is common in older mines and is not a cave-in, rather a fill-in from hillside debris above the entrance. 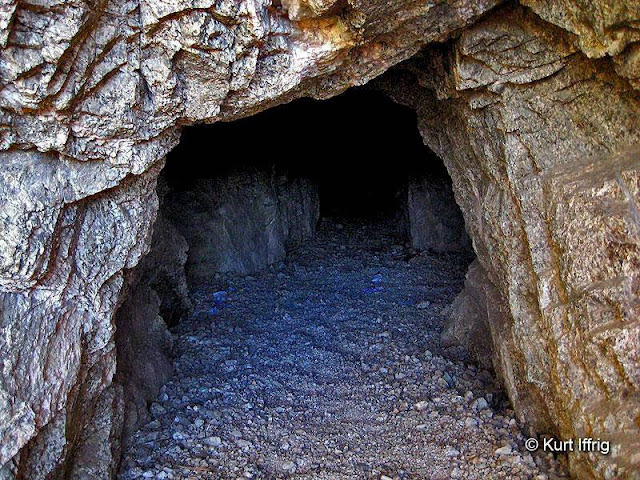 This mine is reportedly the home of several bats and was high enough to walk through comfortably back in 2005. Perhaps at a later date I will dig out that portal. This is known as Hogback Road. It once led to the deepest tunnel Emma tunnel (500 feet deep). There is a third tunnel (a vertical shaft) about 1/2 mile from the first two tunnels. It is about 25 feet deep and is burrowed into the side of a sharply crested ridge known as a "hogback". The deepest mine was once located at the end of a dirt road called Hogback Road. According to a 1957 issue of Desert Magazine it was still safe to walk through at that time, but for some reason was later sealed. I know the approximate location, but it would be next to impossible to pinpoint and dig out its entrance. Vintage photo of the old loading chute. Above this area is a detritus pile rich in green waxy quartz. 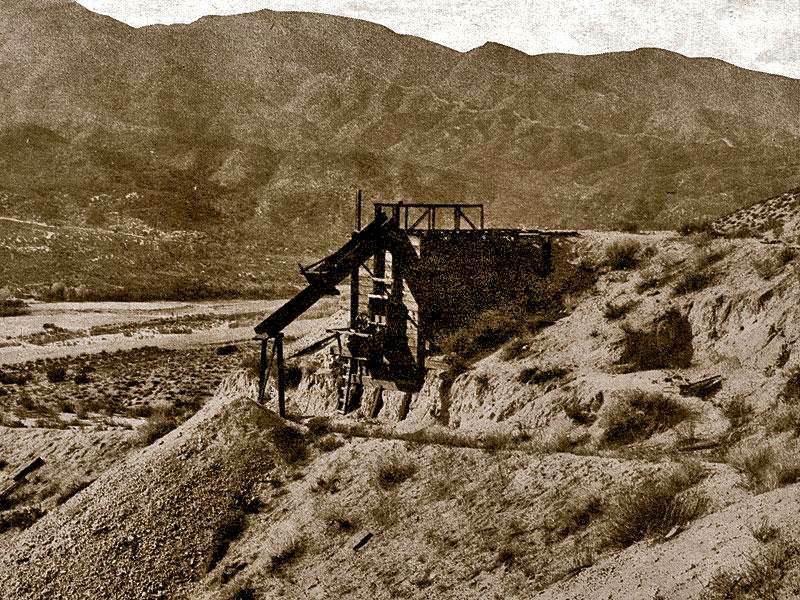 In 1888 the Emma Consolidated Mining Company began mining for copper on the south slopes of Parker Mountain, between Acton and the small, now defunct town of Ravenna (also known as Soledad City). This mine's four tunnels were known as the Emma, the Bullion, the Pacific and the London. 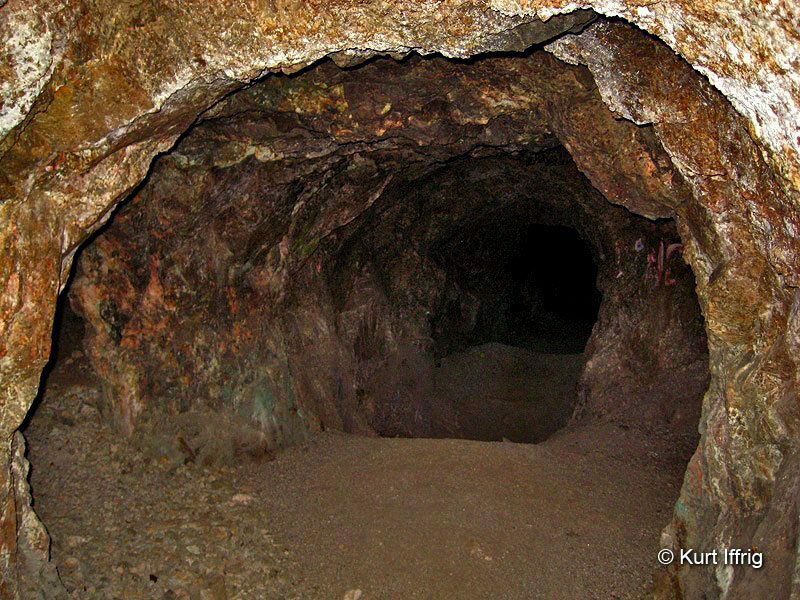 These mines were profitably worked from 1888 until about 1900, when a change in the world price of copper, caused mainly by competition from the rich Chilean mines, forced them to close. At one time the Emma (Conover) mine was owned by Henry Gage, who became California's 20th state Governor. He also owned the Puritan (Union), the Don (Hi-Grade), and Red Rover (Golden Lady) and the wildly successful New York (Governor) mine, which alone produced $1.5 million from 1895-97. Basalt and pink brecia cliffs somewhat near the main Emma tunnel. There is a vertical shaft in this area. From 1927-28 the Emma or Conover Mine became a patented mine which belonged to the Tonopah Milling and Mining Company. Later, two men, Crawford and Gage, secured the right to reopen it and they took out ore at various times, the last mining occurred in 1949. 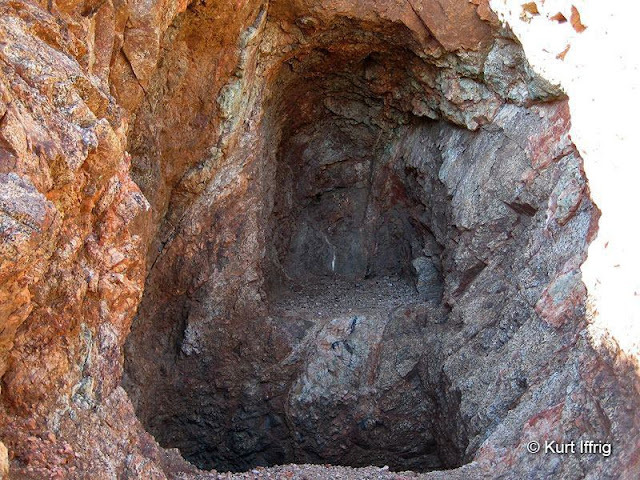 This was primarily a copper mine, but gold and silver were also extracted. Emma Annex tunnel portal, currently too narrow to fit through. This tunnel is reportedly 278 feet deep. Little remains of the old loading chute today other than a few wooden scraps below the main adit, and the deepest tunnel has been completely sealed. All of the ore cart rails have long since been removed. However this area has become a magnet for rock hounds who seek out a beautiful garden rock called waxy green quartz. In a nearby dry stream bed they hunt for prized moss agates. Blue-green copper quartz is scattered everywhere. If you scroll down you will find an old map of green quartz deposits prized by collectors. This is tunnel number three, a 25 foot vertical shaft dug into the side of a sharply crested ridge or "hogback". It appears that miners originally intended was to dig horizontally, but then chose to follow a downward vein. The name Soledad was already taken by a town in Northern California. To avoid confusion the town was renamed "Ravenna" after the well respected Manuel Ravenna, a saloon keeper and merchant. Ravenna's original population was 32. 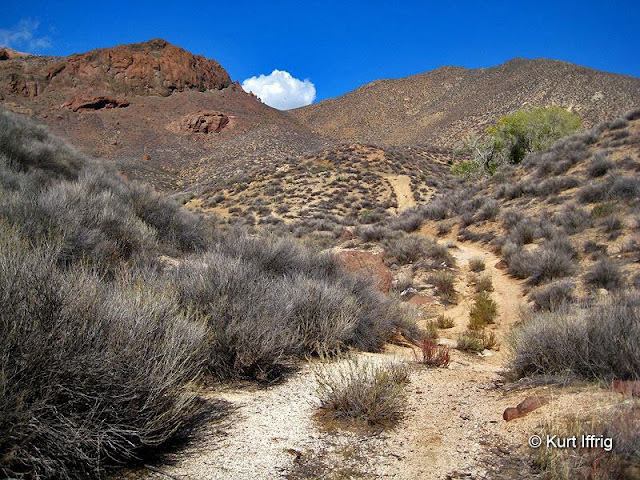 There is nothing left of Ravenna today, but the town site can be visited by taking Soledad Canyon Road up to Bootlegger Canyon Road a few miles southwest of Acton. In the early days of mining the Soledad Canyon, miners faced a unique challenge in transporting ore to Los Angeles for processing. 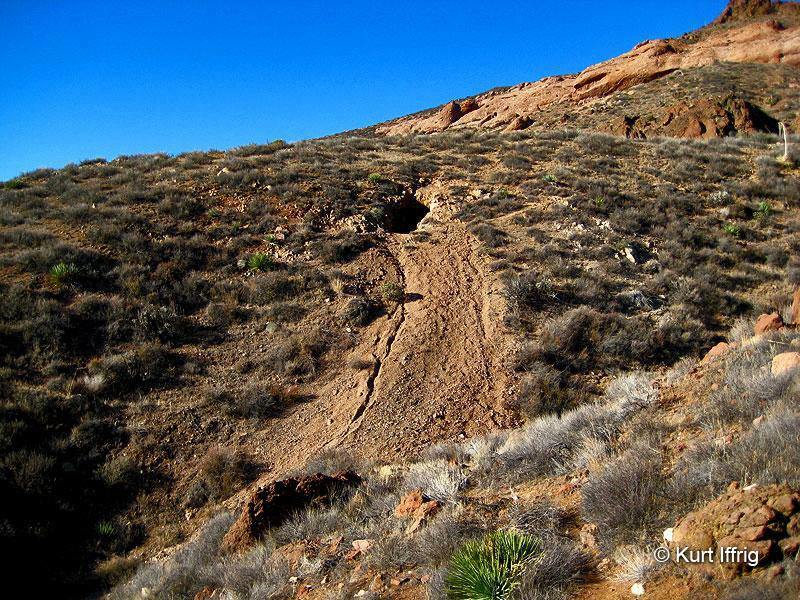 A central wagon road had been built through the desert and through the canyon, but the mountainous region near the modern day city of Newhall was nearly impassable. To solve this problem General Edward Fitzgerald Beale cut a deep and narrow notch into the mountains creating a pass in 1863. 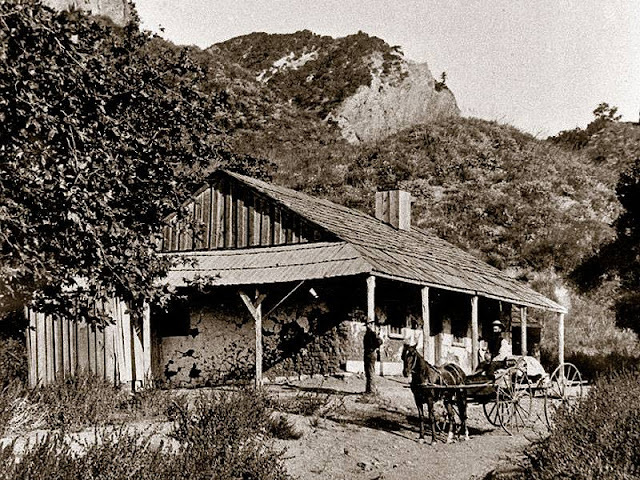 Prior to that wagons had to be winched up and down the mountainside and there were no other routes connecting Los Angeles to the north. Ore from Soledad and Cerro Gordo mines in 1875. 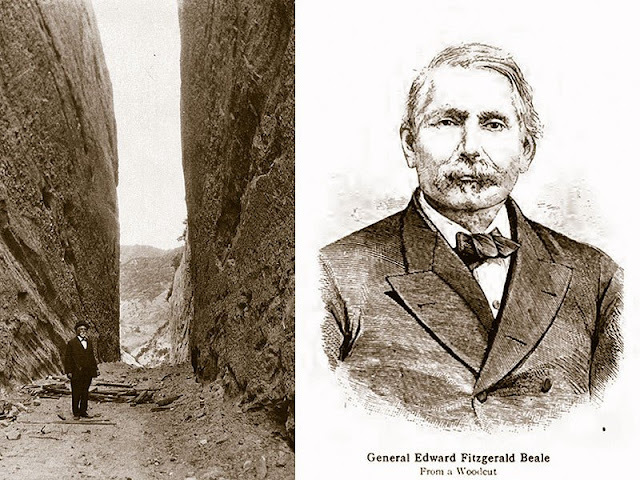 Narrow wagons were designed to fit through Beale's Cut. This notch went by several different names and was not actually referred to as Beale's Cut until the 1930s. Prior to that it was most commonly known as Fremont Pass, named after John C. Fremont, who passed near the area in 1847 but had nothing to do with digging the cut. At times it was also known as the San Fernando Pass, the Newhall Pass, the Newhall Cut and the Newhall Grade. This cut was the site of several western movies, but due to the soft rock it was cut into, it eventually collapsed. Today only a small portion of Beale's Cut still remains. After the cut was completed, a long adobe toll house was set up, forcing anyone who wanted to pass to pay a toll of 10¢ fee “per head”. The toll franchise extended three miles each way from the cut, so that no one could avoid paying the tolls by going around it. There is a story of one sheep owner who tried to bypass the toll by taking 3,000 sheep across to the west of the cut, only to be met by a United States Marshall awaiting him in Saugus, to collect 10¢ a head. Toll house set up by General Edward F. Beale and partners below Beale's Cut. The toll was 10¢ a head. Sweet! Did you also get a no trespassing warning but an angry dude? I didn't see the angry dude, in fact I didn't see a soul out there. Hope he doesn't get upset when I attempt to open up that annex tunnel that's too small to crawl through.